The Senator who was popularly known as Oakwood Mutiny leader during the Pres. Arroyo administration commented on the results of the recent survey for the presidential candidates. Davao City Mayor Rodrigo Duterte who topped the said survey remained no. 1 choice in NCR, Visayas and Mindanao. 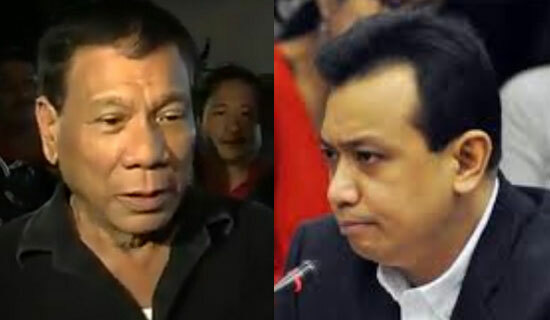 Sen. Trillanes said at a forum, "Ito po ay isang propaganda galing sa Duterte at Cayetano camp na kumbaga ay niluto." He added: "Tingnan n'yo 'yung question. Very obvious 'yung question. You don't state that... It's violative. Those who are well-versed in qualitative research, hindi papayagan 'yan." Senator Antonio Trillanes IV is also running for vice presidential position to the upcoming elections 2016 in May. He is also known supporter of presidential candidate Sen. Grace Poe but she was disqualified. According to GMA News, "Trillanes also pointed out that the survey firm also conducts its polls in Davao, known as Duterte's bailiwick, which to Trillanes means it would 'automatically favor' Duterte." The businessman behind the Social Weather Stations (SWS) survey for Duterte was commissioned by William J. Lima, who is Duterte's friend, according to news. The SWS poll was titled "Project ROD 11-15," which gained 38 percent votes for Duterte and placed in first place, it was conducted on November 26 to 28, with 1,200 respondents. Comments or suggestions about "Sen. Trillanes IV: No. 1 spot Duterte's survey was rigged" is important to us, you may share it by using the comment box below.